On April 6, 2009, a powerful earthquake struck l’Aquila, Italy. Three hundred and eight people died, and most of the buildings in the city center and surrounding areas were damaged or destroyed. About six months ago, we received an email from a British architect named Barnaby Gunning proposing an ambitious project: to use Google SketchUp to build a digital 3D model of the city, as it is now, in order to stimulate discussion about its reconstruction. 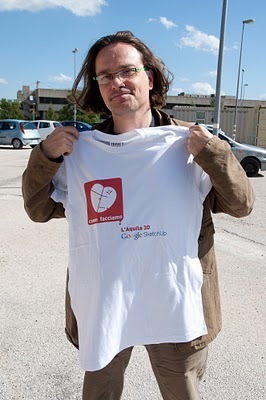 He had already created a website—called Comefacciamo ("What can we do? ")—to contact and organize volunteers. Barnaby asked if Google would support a geo-modeling workshop in L’Aquila in an effort to create a digital model of the city. An engineer working on SketchUp and an Italian by birth, I was asked to travel to L’Aquila and give geo-modeling classes in Italian. I was excited! I could visit my motherland, teach people about the product I work on and help out with a project that could have a great impact on reviving the city. I ended up teaching six full-day classes over the course of two trips in October and November. Teaching in Italian about a product on which I work almost exclusively in English proved to be more challenging than I thought. It took me awhile to get used to using the correct Italian name for the Push/Pull tool: Spingi-Tira. (It’s more fun to say, though.) The passionate volunteers who attended my classes more than made up for the language frustrations. Not only were they interested and attentive learners, but their desire to do something for their beloved city was contagious. 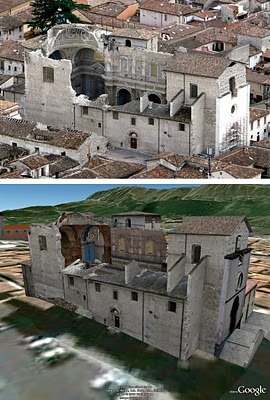 The church Santa Maria Paganica in real life (top) and modeled with SketchUp in Google Earth (below). The modeling phase of the project is now in full swing. Several of the volunteers’ models have already been accepted into Google Earth—you can see them in your browser if you like. You can even take part in the project by helping to model the city from wherever you live. We’ve added L’Aquila to the list of places where you can use Google Building Maker to create geo-models, so no previous 3D modeling experience is necessary. If you’d like to dive in a little deeper, you can use SketchUp in connection with the many photos and other information on Barnaby’s website. My few days in l’Aquila teaching SketchUp proved to be a fantastic experience. I met so many people who are enthusiastic about this project and willing to sacrifice their weekends to learn how to model, and to provide an exhaustive photographic record of the current situation. The time I spent with them was a wonderful remainder of the love they feel for their city—a love that I now share. I count myself lucky to be a participant in this important project. Seriously Simone...I'm not even completely sure how I ended up on this blog, but here you are! This looks like an amazingly ambitious project-much good luck to you.